« BBC content coming to XBox Live? The good news: Major U.S. television networks continue to embrace Internet technology and are putting their shows on the Web for online viewing, just like they did last year. The bad news: Their online offerings remain sporadic; their Internet strategies feel like “we have to” rather than “we want to”; and — worst of all — they still haven’t embraced the idea that we are living in a new digital world, with different rules, participants, and expectations all around. We’ve looked at the online offerings of the five major networks — ABC, CBS, NBC, Fox, and The CW — and sadly no one is blowing the game wide open, although they’re trying. To their credit, the networks are offering some of their top-rated shows online, viewable on their own websites. But to their discredit, the networks don’t provide streaming for all of their shows, prime time or not, and streaming schedules vary widely. While video quality continues to improve, many networks have crowded and difficult to use interfaces, which detracts from the fun of watching a favorite TV show. Sometimes it’s just not worth the effort. Here’s our journey through the land of network streaming. Streaming should be integral to the networks’ new digital strategies, but the networks might be slow to coming around because of technology. For the best streaming experience it helps if you have the latest and greatest everything. While standard definition programs will stream fine over regular broadband connections like DSL and cable, high definition programs require more bandwidth, so it’s best to use upper-end DSL, cable, or fiber optic options. I tested streams from the networks using a last generation Mac Powerbook and a Dell laptop. In each scenario, the video was choppy and the audio track was sometimes off. When I closed out of programs I was not using, the video performance improved but I couldn’t work or surf while watching. Like everything with computers, the more processor, the more RAM, the better video capabilities, the more you will enjoy your streaming experience. Streaming is handy because if I miss a show, or I fail to record it, I can still view the program the following day on the network’s website. I may have to endure a few embedded ads, but it’s a small price to pay to keep up to date. And it’s cheaper than buying the show from iTunes or Amazon and a heck of a lot more convenient than illegally downloading it over BitTorrent, which the average viewer doesn’t mess with anyway, no matter what Hollywood and TV Land say. So what’s available? The best way to find out is to poke around each network’s website because streaming schedules vary, just like like season premiers. To get a quick at-a-glance view of the networks’ upcoming season and which programs are available for streaming, check out our handy guide (.pdf). What’s most frustrating about the networks’ streaming schedules is inconsistency and a lack of a TV guide-like index. Some networks leave programs up indefinitely. Others take shows down after a few weeks or once the season is completed. If you plan to follow a show on the Internet, it’s best to find out the program’s streaming schedule in advance so you know when it will first appear and when it will disappear. My wife is still frustrated that episodes of CBS’ “New Adventures of Old Christine” are no longer available, even though the show is scheduled to return this season. With that in mind, what is available from each network? ABC offers five of its top shows for streaming — “Ugly Betty”, “Grey’s Anatomy”, “Men in Trees”, “Desperate Housewives”, and “Brothers & Sisters”. Other, older shows are also available, including “According to Jim”, “The Bronx is Burning”, “Day Break”, “Fashionista Diaries”, “Fat March”, “Knights of Prosperity”, “The Nine”, “GH Nightshift”, “October Road”, “Six Degrees”, “Voicemail”, and “What About Brian”. ABC’s player (powered by technology from Move Networks), is slick and by far the best of any network. It’s video quality, for full screen, big, normal and mini-mode, is very good to excellent. ABC also offers high definition streaming. ABC, which is owned by Disney, who happens to have a board member from Apple named Steve Jobs, extends its digital presence beyond streaming by offering a fair mixture of new and older shows for purchase through the iTunes Store, a relationship that’s expected to continue. ABC seems to be on path of traditional distribution mixed with a strong ABC.com streaming portal mixed with making certain shows available through the iTunes. 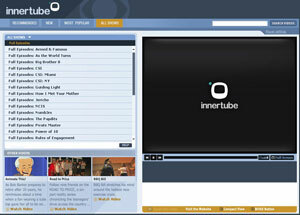 CBS’ chief Internet strategist, Quincy Smith, said the network’s video presence on the Web should be “CBS.com/nobodycomeshere.” Its player, known as Innertube, is available through the Website and is based on RealPlayer’s RealVideo technology. CBS offers more of its top programs than any other network, including “Big Brother”, “CSI”, “CSI: Miami”, “CSI: NY”, “How I Met Your Mother”, “Jericho”, “NCIS”, “Numb3rs”, the “Power of 10”, “Rules of Engagement”, “Shark”, “Survivor”, and “The Unit”. Other shows are available, particularly soap operas such as “As the World Turns”, “The Guiding Light”, and “The Young and the Restless”. Rather than rely solely on its website like ABC and the other networks, CBS — to its credit — is drastically revising its digital strategy through a new initiative called CBS Interactive. Its goal is to syndicate as much of its content as possible through through iTunes and sites such as AOL and Yahoo and new media venues such as YouTube, Joost, Veoh, and Brightcove. CBS seems to be mixing its traditional distribution with a strong presence on the Internet, through Innertube and the web syndication network. It’s nice to see at least one network exploring options beyond the usual distribution means and a web video portal. NBC offers a pitiful lineup of top shows — “30 Rock” and “Friday Night Lights” — to go with an offering of mostly fringe shows or programs in need of an audience like “Andy Barker, P.I.” and “Raines”. NBC’s Flash-based player wasn’t bad. It offers normal, large, and full screen viewing and the ability to navigate by chapter, which no other network has. Despite its paltry streaming offerings, NBC was still considered an influential network player because of its involvement with the iTunes Store. NBC made available to iTunes some of its best shows, including “Heroes”, “My Name is Earl”, “The Office”, “Scrubs,” and the “Law & Order” franchise. But this past month NBC and Apple got into a public spat during contract negotiations and the two split. NBC is now offering its shows through Amazon’s Unbox, which is designed to run on PCs and not Macs. The iTunes Store will no longer carry any new NBC programs. Another part of NBC’s digital strategy is to team up with News Corp., owner of Fox, to form what they hope is a YouTube killer. The new site, known as Hulu, is in private beta and will be online in October. Hulu will partner with other destination sites including AOL, Comcast, MSN, MySpace, and Yahoo. NBC’s strategy beyond its traditional network appears to be greed oriented: You like our shows, pay us to download them or buy them on DVD. It also appears that NBC is holding back streaming content so you will go to Hula.com. The quality of Fox’s video player, also powered by Move Networks technology, is good, although the interface is crowded. Its Fox on Demand website, where the player can be found, is wretched because of its clunky usability and weird graphic design. Even so, Fox offers a fair amount of its top shows, including “24”, “Prison Break”, “The Loop”, “K-Ville”, “Bones”, “American Dad” for streaming and/or purchasing from the iTunes Store. Since Fox is a part of Hulu, it’s unknown whether the network and its shows will remain for sale on iTunes. Like CBS, Fox seems to be moving toward an improved Internet presence for its shows through a web portal and through making some of them available on Hulu. The CW doesn’t have as many programs to offer as the other networks. Yet it understands the importance of availability and building an audience. It’s streaming experience isn’t bad but isn’t great, either, although video quality is good (The CW also uses a Move Networks-based player). Nearly every show is available for streaming, including “Everybody Hates Chris”, “Girlfriends”, “All of Us”, “The Game”, “Pussycat Dolls Research Next Doll”, “America’s Next Top Model”, “Beauty and the Geek”, “Supernatural”, and “One Tree Hill”. The CW also makes some current and older programs available on iTunes. 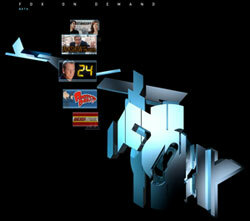 Watching TV shows through a network’s web site, for me, is good in a pinch, but overall the experience is flat. Maybe it’s that the technology hasn’t fully evolved for a pleasant viewing experience. Or maybe it’s that the networks continue to tip-toe. They’re dabbling in online streaming but not pushing the envelope as far as they can. They’re toying with selling their shows through the iTunes Store and Unbox. In addition, mobile operators like Verizon are offering some television content through services such as V-Cast. But it’s not enough. I expect more from the networks. They’re the all powerful ones. They own the content. They order it. They pay for it. They distribute it. They could be out front, yet they’re not using their power to reshape an industry. NBC Universal, iTunes officially divorce, but what about us kids? Typo of the day: “Fox on Demand website… is retched.” That last word is at least at effective as the one starting with a “w”. It was great for Jericho that CBS not only put it on-lline on InnerTube, but left the site up so that we “NUTS!” Jericho Rangers could continue to watch the show while we convince CBS that they WERE on the right track. One baby step for viewers; one GIANT step for corporate America !! BUT they’re stepping. I really love the article on the streaming media shows available online. I noted from reading your biography that you’re based in Austin. If you’re interested in seeing an electronic video catalog technology that merges advertising with content, please let me know. I would be glad to set up a visit with you and our staff. I really love the article on the streaming media shows available online. I noted from reading your biography that you’re based in Austin. If you’re interested in seeing an electronic video catalog technology that merges advertising within the show’s content, please let me know. I would be glad to set up a visit with you and our staff here in San Antonio to show you the latest in product placement technology. That is total crap. I am really bad at getting to shows on time (especially Heroes from NBC). The only way to keep up with them is to watch them online… no, maybe they don’t over them year round, but that is a marketing strategy…. You offer it for the season for FREE…. then, when it comes out on DVD, there is no reason to give it for free when they can make money off of iTunes or the DVD. Think about it…. A nice article, but your pdf of the upcoming fall schedule and which shows will be streaming seems a bit incomplete. None of the new shoes for NBC or ABC are filled in, and I would think they’ll both put their higher-profile content online to build buzz. Are you planning on going back and filling in the schedule once it’s announced which new shoes will be streamed? You complain about TV networks not keeping up with technology and then you post a tv schedule in a PDF? I’d much rather a URL to bookmark then a PDF that sits on my desktop and gets out of date. The guide was just to give you an example of the five networks current offerings to compare. If we published it as a URL I don’t think it would automatically update. Unless you know something I don’t? This is an excellent outline of the major issue with finding high quality network content online – everyone deals with it differently and it’s a *&$% to find. Having said that SideReel (of which I am one of the founders) endeavors to index every episode of every show that the networks host. For example, if you look at 30 Rock on SideReel (http://www.sidereel.com/30_Rock) you will see prominent links to each episode that’s available on NBC.com, as well as links to it on iTunes or Amazon if they’re available. We try to do this with every show that’s currently aired. 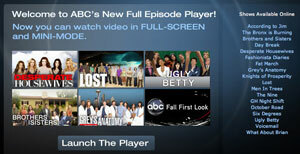 It gets more complex, however, with sites like ABC.com which force a user to go through their player to find as well as to play an episode. This is fine if you’re interested in playing the guessing game and watch whatever they have online. Unfortunately, they rarely have every episode of every show online and they don’t publish a feed of these links making it impossible to deep link to these shows. Unfortunate, as we’d love to direct our users there. None of this content is viewable outside the US ? You failed to mention that none of these services are available to people outside the USA. It’s quite brilliant the way the networks make it so difficult to view their shows through their own websites, but it’s relativly simple to pirate much higher quality videos which I can save, pause faxt forward, and generally work no matter what browser or player I choose to use. although I shouldn’t be surprised seeing as their political views seem stuck in the dark ages as well. Mostly I’m just disappointed that they are all so short sighted. TV streaming through the internet, what a great idea. I watch alot of entertainment through video streaming online and its great that big players are catching on to this, shame shows aren’t covered all year round but it is a start even if it is a slow one. Can’t wait for that day where I am free to roam around watching anything I please on my iPhone. In reality, ABC, FOX, and CW all use the same player from Move Networks. Essentially, it’s the same thing (the reason you only have to download it once) on all three of the sites, the only real difference being the bit-rate content is being served at. And it’s not based on Flash, it’s a proprietary format that uses a QVT file to send little packets across the web, to provide a non-buffering experience for end users that scales based on their connection speed. Just a bit more info. to let you make sense of what’s going on in the world of streaming. Thanks for the clarification. I’ve updated the post. NBC uses vanilla Flash streaming and IMO doesn’t come close to ABC’s video quality. Alpha Exposure, LLC and Zero Footprint Solutions, LLC have joined forces to deliver the next generation of Internet streaming media technologies. We provide video using completely new core and enabling technologies to instantly provide streaming High Definition video up to 1080p quality to virtually any broadband user. The system is optimized to support television networks and movie rental companies moving into the online video markets in terms of quality and concurrent users. “The timing for these services is perfect”, says Robert Brim, CEO and Co-Owner of Alpha Exposure. “We are a success driven marketing company that uses advanced technology to provide value added services to a new and rapidly growing online video market”. “People are looking for different types of entertainment, when and where they want to see it and we can deliver a high quality experience that meets their needs”, says Brim. To view demonstrations of advanced high quality HD streaming, visit us at http://www.alphaexposure.com/videostreaming or contact us at 1-417-332-0456. You’re crazy if you think there isn’t allot of viewers using “torrent” sites.I’ve seen episodes of shows get downloaded 300,000+ times,and that was actually a few different shows getting stats like that.The reason that number is so high is because these over that air networks mentioned here over no live feed to their programming.It would not hurt them in the least to broadcast live over the net.The viewer would still be seeing the same commercial advertisements they see anyways,isn’t that the point? So until these networks over that expect that number to stay high.Don’t believe my logic on the number of downloads? Visit http://www.demonoid.com and find out for yourself. You’re crazy if you think there isn’t allot of viewers using “torrent” sites.I’ve seen episodes of shows get downloaded 300,000+ times,and that was actually a few different shows getting stats like that.The reason that number is so high is because these over the air networks mentioned here offer no live feed to their programming.It would not hurt them in the least to broadcast live over the net.The viewer would still be seeing the same commercial advertisements they see anyways,isn’t that the point? So until these networks over that expect that number to stay high.Don’t believe my logic on the number of downloads? Visit http://www.demonoid.com and find out for yourself. Yes this I noticed too. The Move player software they all use is one more security risk on your computer. All important security sites on the net issued advisories for the Move networks player on a regular basis. The reaction time of this company is slow. I understand a bit that the networks want to know who watches their programmes and when, but OTOH everybody has already 1-5 media players on his computer and it’s an unreasonable demand to install yet another one that has potential to open your computer for criminals. set up HotSpotShield VPN to watch streaming video on Hulu.com outside the U.S. The guide can be used for any other service with country restrictions as well, including ABC, CBS, NBC etc. I can’t believe this article was written with a straight face while talking about cbs. I have watched all the networks online now and the only one I consistantly have a problem with is cbs. In fact the only thing that works well online for them is their commercials. The videos constantly stop and start when they will load at all. It’s clear to me they don’t care about their viewers and the irritation they cause them. I cannot stand NBC online player. It’s extremely slow. I don’t know if anyone else has this problem, but I’ve waited 30 mins and all that loaded was 2 seconds of the show. I’ve tried Firefox and IE and it’s the same shitass problem! Never had this problem with other websites though – other websites just load and I watch as it loads. i want them to stream line sports like the basketball and football games that they are televising anyways. i work and do not have access to cable nor a tv but i have a dsl line and a laptop that i am aloud to use .i mean espn streams the basketball games that they are televising on espn 360. Last year it worked fined, but this year suddenly I can’t watch the episodes from cbs.com in full screen! I can watch full screen episodes on all the other television station’s websites. My computer is in prime condition-I did full check ups…what’s the problem CBS? I can’t see the videos in CW11 and abc.com in full screen!!! I used to see all the episodes in full screen but now I can NOT!!! It’s very annoying… What’s the problem? How can I fix it? Also if you are using iGoogle as a home page, heres great gadget watch ABC, CBS, CW, FOX, NBC shows online to help you to access most major channels prime time shows online on their official sites fast and easy. Here is what you need to do : On your iGoogle home page click on “Add Stuff” link in upper right corner. It will open gadget central and search for “Watch ABC, CBS, CW, FOX, NBC shows online” to locate that gadget. Or if you like an easy way, heres direct link to it http://www.google.com/ig/directory?hl=en… . I'd like to see round the clock live multicast streaming video from my local network affiliates. I've got DSL, but over the air reception in my area is poor at best. Dumped satellite as I don't watch enough TV to justify the expense. If they're worry about out of market viewing perhaps they could issue digital keys to local residents to control access. Interesting Article. Yet I think we have the tools and solutions the market has been waiting for! We at Bemote Technology with Eye Exposure have developed a unique Internet TV Network application, which will empower any TV Network or an individual with Inter-Next Generation technology for live streaming, on demand and pay per view broadcasting. Our platform is interactive with proprietary modules and widgets that can be embedded in social communities, blogs and public forums on the net for the best viral effect. Our crawler technology provides optimum target market Eye Exposure Marketing Solutions, capable of driving strategic traffic to any web presence. We can and will empower you to be in control of your own Internet Network, so that you can broadcast whatever content you want 24/7. The quality of the video will be as good as the format in which it was produced. Why settle for less when you can have the best. Call us now for a quote and get empowered with your own Bemote Remote Control Internet TV Network or Channel and start watching your favorite content either online or hook up to your wide screen TV for an unbelievable experience, simply by using a (15 pin Male or Female extention cord) For more information contact Marisela@bemote.com or visit our demo site @ http://www.eyeexposure.net where you will find a wide range of Interactive Inter-Next Generation Technology tools and Eye Exposure Marketing Solutions. To see a sample of MY Versatile TV Channel embedded on My Space visit http://www.myspace.com/eyeexposure. I’m blocked from viewing content from NBC. Will a VPN like arcvpn unblock the content like they say?